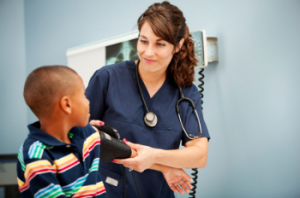 Can You Become a Pediatric Nurse With an Accelerated Nursing Degree? If you are considering a transition into nursing from another field, you may want to know how you can become a nurse with an accelerated nursing degree. How does this degree work and how quickly does it enable you to enter the profession? You may also be wondering if all nursing specialties, such as pediatric nursing, are open to someone who has completed an accelerated nursing degree. In recent years, the nursing shortage in the U.S. has fueled innovative ideas to ensure that more students are able to access training to become qualified nurses. One idea that has grown popular is the accelerated nursing degree. This degree exists to help students who have received an undergraduate or graduate degree in a discipline other than nursing transition more quickly into the nursing profession. If you hold a degree in another field, you can now enter a “fast-track” program in nursing, at either the bachelor or master’s level, according to the American Association of Colleges of Nursing. The accelerated bachelor’s degree can take anywhere from 11 to 18 months, while the fast-track masters takes about three years. In both cases, students take classes at a more intense pace. Since the schedule is full-time without many breaks, it is usually recommended that students try not to work on top of taking classes. It is expected that students who already hold a college degree should be able to keep up with the pace and demands of an accelerated program. If you become a nurse with an accelerated nursing degree, it should place no limits on the contours of your nursing career, beyond the unavoidable fact that you may be starting your career later than a traditional student. The education you will receive in an accelerated program provides the same clinical hours, for instance, that you would have gotten if you’d gone through a typical program. Once you have passed your exam and obtained your RN, you can work toward nursing in any of the different fields in which you might be interested, including pediatric nursing. If you have gone through an accelerated master’s degree program, there’s a good possibility that you might be steered in the direction of nursing education, since there is a shortage of faculty nurses. But nurse educators work in all areas of nursing, so that would not shortchange your career options either. Both students and the profession itself can benefit from accelerated programs. The most obvious benefit to you as a student is that the accelerated degree enables you to launch into the profession more quickly. Although an accelerated program may take a significant financial investment, especially in lost work time when you’re taking intensive courses, some employers have even begun repaying some tuition costs as part of their recruitment of new nurses. They know that the profession benefits from the fact that accelerated program graduates tend to be older and more mature, making them highly motivated workers. A college degree in a non-nursing field doesn’t have to be a barrier to a nursing career. If you already have a degree in another field and decide to pursue nursing, look into fast-track programs. They can help you to become a nurse with an accelerated nursing degree.